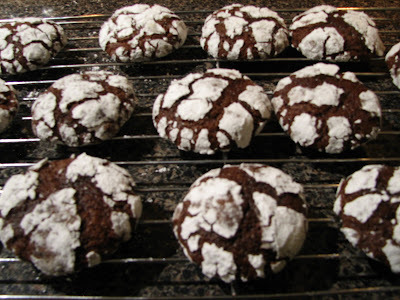 I'm a chocoholic, so when I was given this recipe for"Chocolate Crinkle Cookies" a few years ago, I was thrilled. They are perfect to add to your list of sweets to bake for Christmas, or for any other time when you may need a sugar and chocolate fix! When my kids were little, I started the tradition of baking cookies with them and then taking the sweet treasures to friends and family to enjoy. Oh my, did I ever have some mega messes to clean up, but what fun we had! My kids fondly remember rolling dough, making icing, plus of course, eating the sweet treets too. I treasure these memories now. "Chocolate Crinkle Cookies" need to be chilled for several hours or even overnight for the best success in rolling the dough into balls. Also, the cookies can be chewy like brownies, or more cake like, depending on how long they are in the oven. As the cookies bake they will puff up and settle slightly giving them a mottled look. But they are so good, fulfilling any chocolate lovers craving. So let's start, shall we? Melt the butter and unsweetened chocolate together. You can do this in the microwave or in a double boiler. Add sugar and eggs to the butter mixture. In another bowl mix the flour, baking powder and salt and add to the butter mixture, along with the vanilla. Mix well, cover with plastic wrap and put in the fridge at least 2 hours, or overnight. Preheat oven to 350 degrees; grease the cookie sheet. Roll about a tablespoon of dough into balls and then roll into powdered sugar and place on a cookie sheet. Bake for about 12 minutes, depending on the size of the cookies. Cool on wire racks. I plan on taking cookies to some of my friends and neighbors and my pastors family this year. What about you? Do you bake cookies for gifts? If so, what kind do you like to bake? Please leave a comment and let me know, OK? I love crinkle cookies. Now I am having a chocolate craving. May have to get some of these started today! Have you ever tried the cheater recipe using a devils food cake mix? Yum! Kristen, thanks for your comment! Your my first, but I guess you could tell that. I have not seen the recipe using a cake mix.It would be quicker too. Thanks again!